Posted byMike Nolan	 December 7, 2009 December 7, 2009 3 Comments on Merseyrail mobile website? Last week I was catching a train and noticed a poster in the station I’d not seen before advertising the new Merseyrail website. Even more interestingly they encouraged travellers to access from their mobile. 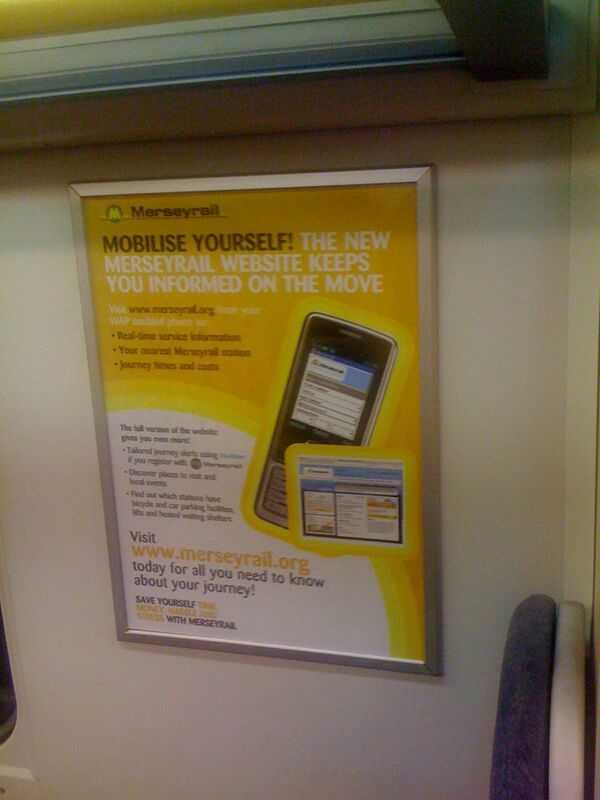 Only one URL was printed on the poster – www.merseyrail.org was printed on the poster so I tapped it into my iPhone and was a little disappointed by the result. That’s what I’m doing wrong but even on phones which support the so-called “full web”, users will often benefit from a mobile version tailored to the functions they’ll want to access out and about. For users with modern mobile browsers giving the choice between versions is the best thing to do. We’ve been thinking a lot about the mobile web recently – in fact for the last couple of years but we don’t want to simply create a version of the site with stripped down stylesheets – it’s equally important that we change out Information Architecture to ensure that when people are using a mobile device, whether that’s on the train, walking around campus on sat on the couch, that they receive information that it relevant to their situation. Jenny Jordan – our customer services manager and part time student here at Edge Hill – is currently undertaking some research into the area of mobile devices and related technologies and I’m planning to use some of her findings to guide what we develop over the coming year. You can help by completing a survey – you’ll also be entered into a prize draw – be quick though as you only have until 10th December. I fully intend to use my iPhone for my students’ feedback. Picture quality, sound quality excellent. Upload to YouTube quick and easy. Personal, human and economical. Why would I not? How about SMSs on delays, cancellations, etc. ?